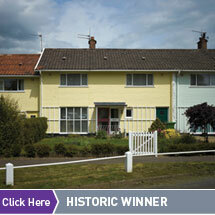 It is notable that 2009's Completed Award winners all include homes designed for families. 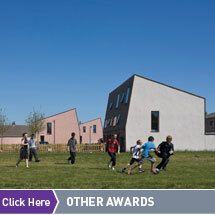 Whilst the winning schemes all go the extra mile, whether through their eco-credentials, their use of modern methods of construction, or a strong focus on design quality, it is the back to basics provision of good family homes, spaces and neighbourhoods that have given them the edge and provided what people want. Apartment living can also be very attractive when designed well and this year we have great examples in both the Project and Completed Award categories. These schemes illustrate the emerging consensus on how to design apartments that people would want to live in over the longer term. Our Completed Award winner, Angel Waterside is a scheme which maximises the number of apartments with more than one aspect by using multiple cores. The design makes it a challenge to tell the social rented flats apart from the market sale ones. 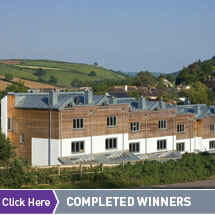 Layout and quality of private and public space is reflected in this 2009's Overall Winner, South Gate in Totnes. 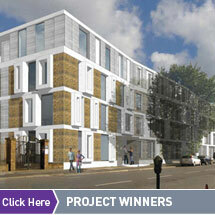 This scheme demonstrates the benefits of when an ambitious local authority takes the lead; assembling a site, organising a design competition where the brief was to maximise low cost homes for local residents, and then managing a process where the intricate vision of the winning design made it to site intact. Judges noted how South Hams recognised the limits of the private sector to fund everything, and worked supportively to achieve joint goals. This is a valid message as we celebrate the best buildings and designs submitted in 2009. They remind us what is possible, and demonstrate how true partnership can still deliver our ambitions for quality homes and environments to live in.